As Germany bit Brazil 7-1 in their own country last night, Twitter's reaction to the World Cup match went into overdrive - and once again Lethal Bizzle was the real winner. So we've coupled up his tweets with some of the most memorable images from the night. 1. 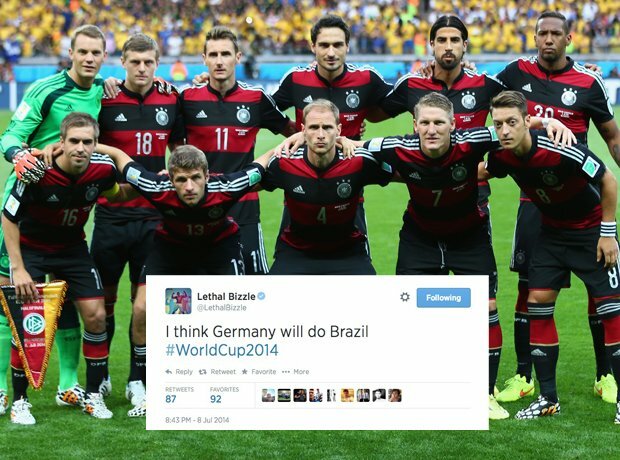 Most of the world was backing Brazil, but Lethal Bizzle had a feeling it was Germany's night. 2. And then the German goals started to go in. 4. And in as the Brazilian defence was no where to be seen. 5. Lethal Bizzle thought he was watching cricket at one point. 7. And as the seventh went in, so did Bizzle with his assessment of the game.